Most entrepreneurs think that “growing” equals “gaining.” But in SaaS, there's a much more important factor than acquisition. Customer retention is the essential—but often overlooked—foundation for growth in subscription-based services. Though you'd probably agree that the concept of customer retention is important, you're probably not taking the time or effort to calculate it right and try to improve it. There is no way to run a sustainable business without a focus on user retention calculations. Any degree of user churn will drag down your company and sink your revenue. Instead of wasting your efforts on futile acquisitions that will churn out weeks and month later, focus on retaining and monetizing the customers you already have. Start by understanding why you're thinking about retention the wrong way. As startup advisor and investor Andrew Chen points out, acquiring users looks like the ultimate growth solution because it “seems to be the very definition of growth.” This is what leads SaaS companies to misguidedly focus too much on customer acquisition and not enough on customer retention, even though customer acquisition is actually one of the least effective growth levers. 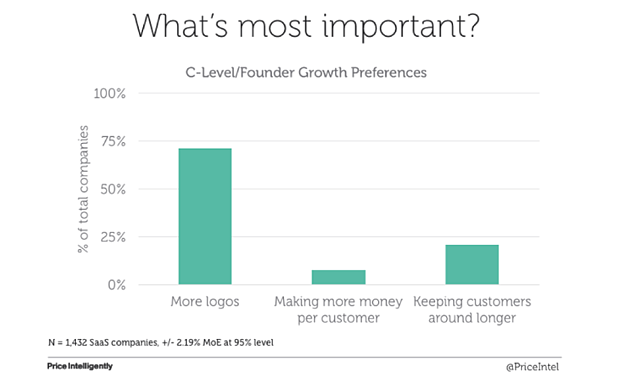 In a study of 1,432 SaaS companies, C-level executives and founders overwhelmingly placed more emphasis on “gaining more logos” (customer acquisition) than on keeping customers around longer (customer retention). Around 70% of SaaS leaders said that acquisition was their biggest goal, while about only 20% believed customer retention was their most important goal. That's not to say SaaS leaders don't care about retention—they just aren't prioritizing it or putting in the effort to optimize it. But failing to actively try to increase your retention rate (the percentage of customers that continue with your service over time) and correspondingly decrease your churn rate (the percentage of customers that discontinue with your service over time) can mean a swift and painful death for your company. 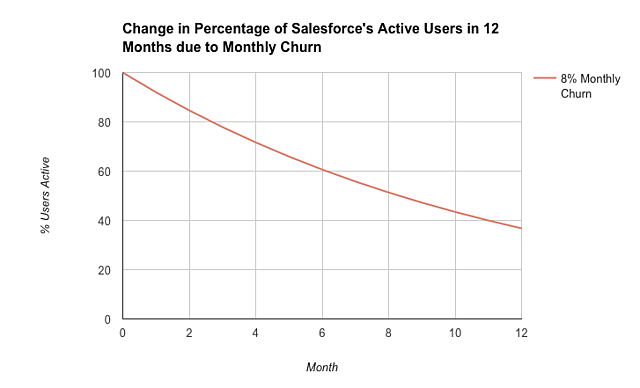 Salesforce realized this the hard way in 2005 when their user churn rate was 8% per month. Every year, nearly three-quarters of Salesforce's customers were leaving. But Salesforce executives were too focused on customer acquisition to realize that as they added more customers, the foundation for their customer base was leaking out—in the form of terrible retention rates. Salesforce found that retention rates this low (92%) made it nearly impossible to sustain, much less grow. To grow by just 1 customer at this rate, if Salesforce started the year with 1,000 customers and lost 630 over the course of the year, they would have to acquire 631 new customers from a now-smaller potential market in order to achieve any growth at all. Companies in this position have to scramble to fill a leaky bucket. They can't focus on growing the value of their existing customers, which is the best bet for improving revenue. The book Marketing Metrics cites that the probability of a successful sale with a new prospect is 5-20% while the probability of a successful sale with an existing customer is 60-70%. You need to retain and upsell existing customers in order to have the most profitable model for your SaaS company. Salesforce executives reacted to this death sentence with a plan for stepping up customer success efforts. They received feedback from their retention metrics and were able to make decisions that effectively saved—and then drastically grew—the company. Where Are You Making Fatal Retention Mistakes? Customer retention is a feedback metric. It helps you understand how your decisions directly affect your business by showing cause and effect—the changes you make, and the corresponding way that customers retain (or churn). Retention helps you understand the effectiveness of your product, marketing, customer service, and pricing. When customers retain, you know to double down on your efforts. When customers churn, you know that you need to reevaluate and make a change. It seems simple enough, but there are many factors that contribute to retention. With so much riding on your retention rate, it's absolutely essential that you calculate it consistently and correctly. Understanding the four common mistakes below and the resounding effects they can have on your SaaS company will help you make solid calculations that inform smart decisions. Meanwhile MRR retention is the revenue maintained over time from recurring subscription payments. It's the revenue that your company makes on a recurring basis once you deduct MRR lost from active cancellations and delinquent payments. It's most useful to think of this metric in terms of its inverse, MRR churn. 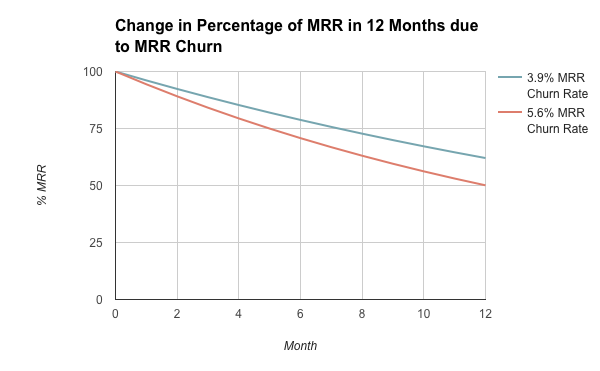 Calculate your company's MRR churn rate by dividing the MRR churn by the total MRR at the beginning of the month. We've explained that user retention provides important feedback on your company's product, marketing, customer service, and pricing. 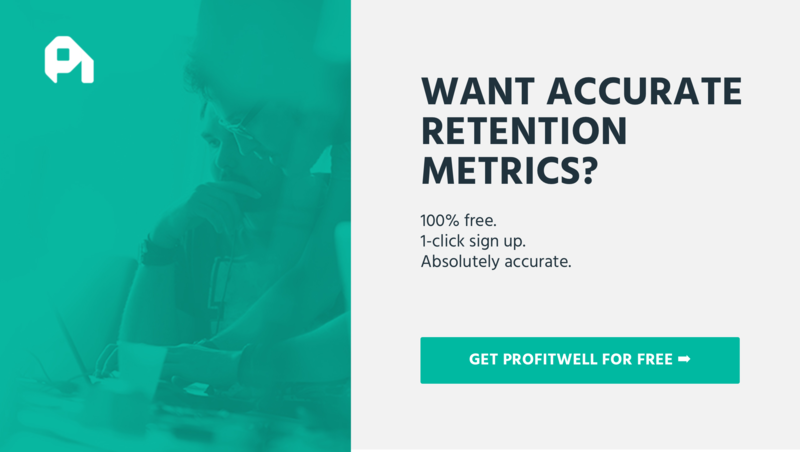 But your MRR retention lets you know if your company can sustain profitability. It's important to look at the two types of retention in conjunction with one another or you may be misled. For instance, one month you may see 7 of your 100 users churn—that's a 7% user churn rate, or a 93% user retention rate. If each of those churned customers were on your lowest-tier plan and paid $50/month, that's $350 in MRR Churn for that month. 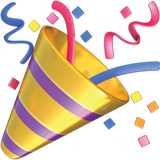 If your MRR at the beginning of the previous month was $9,000 ($2,500 from 50 low-tier plan customers paying $50/month, $4,000 from 40 mid-tier plan customers paying $100/month, and $2,500 from 10 enterprise-tier customers paying $250/month), your MRR churn rate is 3.9% and your MRR retention rate is 96.1%. Now let's imagine that if instead of seeing 7 of your lowest-tier customers churn, you had seen 2 of your enterprise-tier customers churn. With user retention rate at 98% instead of 93%, this might look like a much better scenario for your company. But by losing these 2 enterprise-tier customers, your MRR churn for that month is $500. That's a 5.6% MRR churn rate and 94.4% MRR retention rate. Though the difference between a 96.1% and a 94.4% MRR retention rate might not sound significant, over the course of 12 months, it represents a 12% difference in your monthly revenue. If you started with $9,000 in MRR, that's the difference between making $5,580 MRR at the end of the year or $4,500 MRR at the end of the year. If you had only looked at user retention, you would have assumed you were doing better in the second scenario. Meanwhile, valuable revenue would have been leaking out of your business while you doubled down on the wrong practices. Churned customers have stopped paying you. Cancelled customers have indicated that they are going to stop paying you when the next payment is due, but their subscription period has not expired. Depending on how long your customer's subscription period is and when within the period they “cancel,” you have a window of opportunity to win the customer back. According to our study of 149,000 SaaS customers, about 45% of churned customers cancel an average of 3 weeks before their subscription period ends. There is significant opportunity there to increase retention. If you're counting these cancelled customers as churned, you're throwing away opportunity to retain customers and revenue. You're skewing your current and future metrics for the worse. Imagine that in one month, 12 of your 100 users cancelled. If all of those users actually churned, you'd have a scrawny 88% monthly retention rate. This would be absolutely unsustainable over time—after just 6 months you'd lose over half of your original customer base (54%). If you could recover some of those cancelled customers, you'd accrue significantly more revenue over time in those retained customers' recurring revenue. Though most cancelled customers do have the intention of churning, some may have frustrations or run into obstacles that could be easily overcome with a customer service call. If you can convince even half of those cancelled customers to retain, you'd raise your user retention rate to 92%. After 6 months, you'd have 22% more retained customers than if you had let all of those customers churn. The practices you put in place to retain cancelled—but not churned—customers could ultimately increase your overall user retention rate month to month. Counting cancelled customers as churned is a huge mistake that eliminates this opportunity for improvement. The average of retention rates across customer lifetime isn't uniform. If you treat it as though it is, you won't be able to properly improve retention at all stages of customers' lifetimes. Retention rates of customer cohorts are often different in the early stages of those customers' lifetimes, the middle stages, and the later stages. You can break down customer behavior at these stages into short-term, mid-term, and long-term churn. Customers churn for different reasons at different stages of their lifetimes with your company—therefore encouraging them to retain requires different tactics at every stage. Consider a cohort of customers that began on or by January 1st. Within the month of January, you might see high churn from those customers—say a 10% user churn rate. They're just trying out the product and may not find the value right away. A few months later in April, when the percentage of active users from that cohort only drops from 80% to 78%, you'll see a 2.5% user churn rate. As customers spend more time using the product, they incorporate it into their workflow or into their daily routines. In August when the percentage of active users from that cohort drops from 75.9% to 75.8%, you'll see a 0.2% user churn rate from that cohort. At this point customers have discovered value and become power users. Now consider a second cohort that starts in April. In April, they churn at a 10% user churn rate, and in August, they churn at a 2.5% user churn rate. 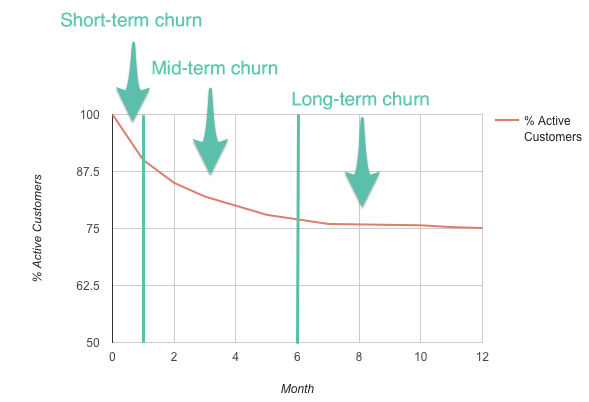 If you're not considering short-term, mid-term, and long-term churn for different cohorts of customers, your user churn rate will only tell you the total monthly churn. When you have a month with particularly high or low sign-ups, you might see a large change in retention rates and not understand why. Focusing on retention by stage allows you to target the different reasons for churn at each stage and develop the most effective strategies for mitigating each one. 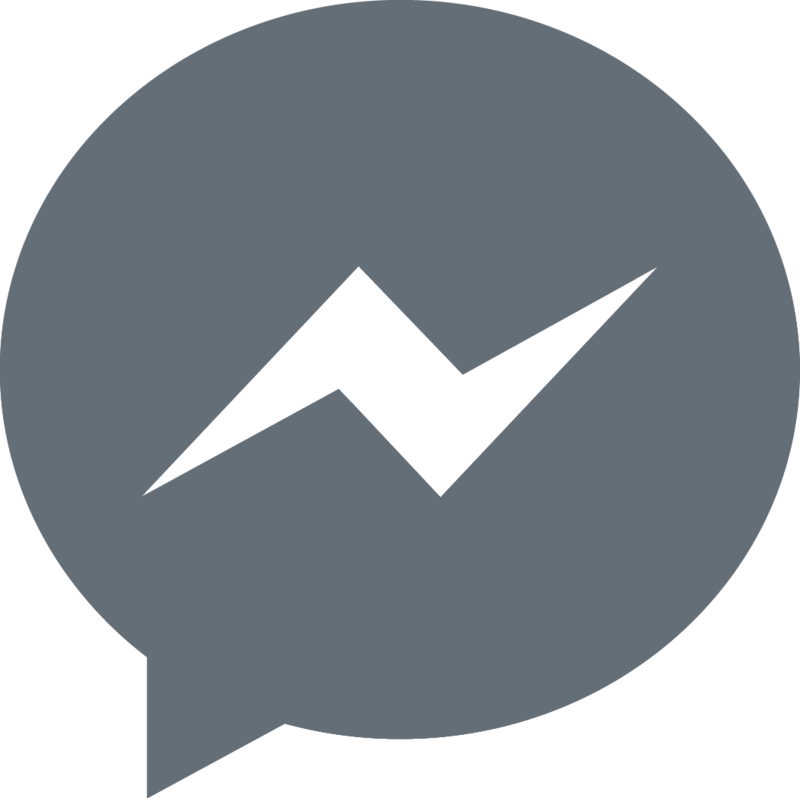 For example, you can improve user onboarding to combat short-term churn. To address mid-term churn, look to constantly add value to the customer experience by improving small bugs and communicating consistently with email campaigns. Finally, you can reduce long-term churn by upgrading existing customers to larger plans that give them more of your company's core value. These opportunities are all lost if you only ever consider total retention. Just as cohorts of customers who sign up at different times will have different retention rates across the span of their cohort's lifetime, customers on different plans will typically show different rates of user retention. Enterprise-tier customers, or those customers on your most expensive plans, are likelier to have higher user retention. According to our study of 941 SaaS companies, customers with 4-digit ARPU had almost 50% less churn than customers with 1 to 2-digit ARPU. Correspondingly, this study also found that higher percentages of annual contrasts correlate with better retention. Enterprise-tier / high ARPU customers typically have longer contracts. This presents less opportunity to churn. The high ARPU value that they present to your SaaS company also increases the likelihood that a lot of customer service time and effort is spent on retaining them. Your highest churn is likely coming from your low-tier plan customers. These customers are less likely to have annual contracts. Your company might take them less seriously and may not direct the right amount of time and effort into retaining them. Though they might not represent a significant loss in MRR when they churn, their choice to discontinue can still affect your brand's reputation—which can negatively affect future acquisition. Realizing the difference in retention between customers on different plans is essential to gaining the strategic and actionable feedback that retention rates provide. The difference in retention rates for different customers will tell you about the strengths and weaknesses of your customer service approaches to those different customers. Focus on white-glove service for all customers by communicating with them frequently and taking action on their frustrations. Conversely, if you realize that you have a problem with low retention among your enterprise-level customers, you'll see a significant portion of your revenue leaking from your MRR every month. This is important feedback as well, because it might indicate that you have issues with your pricing, packaging, or contract length. Experiment with price adjustments and consider encouraging more annual plans. Breaking retention down by the users on each plan helps you further understand where and how your SaaS company can make changes that increase bottom-line retention and bottom-line revenue. Your SaaS company's retention isn't ever going to be static—so you need to pay constant attention and put in the time and effort to calculate it and optimize it. By understanding the nuances of your customers' retention, you'll gain valuable feedback about the decisions you make for your SaaS company. Don't focus on gains to grow. Direct your attention towards getting customers to stick around, and you'll build a stable foundation with huge potential for internal growth. No silver bullets, just solid strategy.